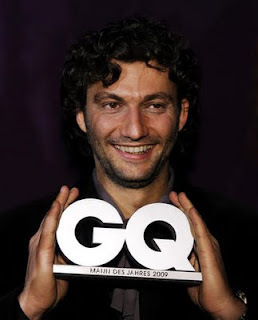 Jonas Kaufmann won the GQ classical music man of the year 2009 award on November 3. Picture was stolen from Parsifal's who probably stole it from somewhere else. Apologies. Classical music isn't even a category in GQ Brittain, as near as I can tell. The men of the GQ awards all have a certain look to them which fits Jonas very well. Thin. Wild hair. Wait a minute! They gave an award to Mickey Rourke.